Enthusiastic crowds are not a typical sight in Canal Point, a small town of about 500 people. All it took was a visit from one important person: President Donald Trump. CANAL POINT, Fla.-- Enthusiastic crowds are not a typical sight in Canal Point, a small town of about 500 people. All it took was a visit from one important person: President Donald Trump. "Our city has a population now,” said Wanda Gonzalez. “It’ll probably just be my first and only one ever getting to see a president," fifth-grade student Scarlett Bolt said. 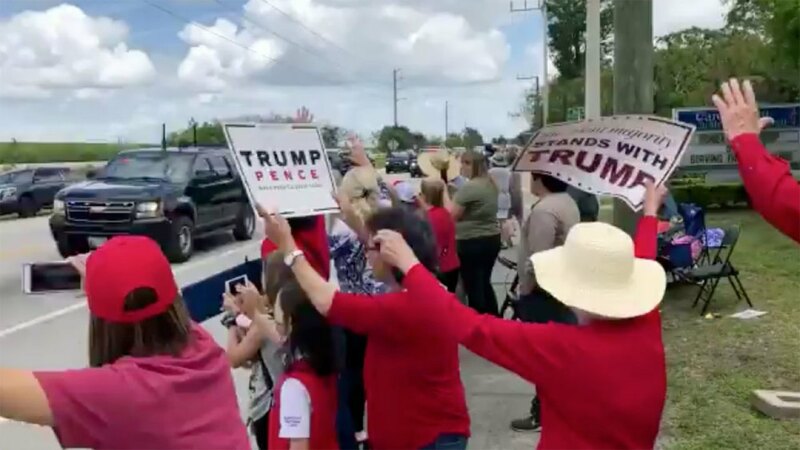 Anxiously awaiting the president’s arrival were Canal Point native families, friends who live in the Glades and future farmers living in Clewiston. All of them are fans of President Trump. "Trump coming to my community. Looking out for us. Trying to help us, so I’m just excited," said Sherrie Dulany of Belle Glade. The crowd had signs, hats and displays of patriotism. “Obviously we’re dressed appropriately for the occasion," said one. "Just the chance to see him is really big for our chapter," said Kalei Sutton from Clewiston Christian School. Marine One flew over just after 1 p.m. and landed. “Thank you, thank you, thank you for willing to try and thank you for really doing something and thank you for loving America," said Barbara Hicks from Canal Point. The main message from many is the need to store or clean water coming from the north before it reaches Lake Okeechobee.